Sample Farm is the VST Sample Player every musician has been waiting for. Sample Farm Pro means perfect integration with any VST compatible application such as Cubase and Logic. It can generate up to 128 voices of polyphony (CPU dependent) at 24 BIT/96Khz quality and it works magically thanks to 32 bit internal processing. 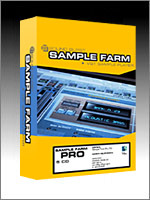 What's more, Sample Farm Pro comes with over 2.8 GB of multisamples – a set of 5 CD-ROMs containing over 600 sound banks. No more hassle looking for sounds, or changing dozens of CD-ROMs the way you would with hardware samplers. With Sample Farm Pro, all the sounds are always available and directly accessible immediately, thanks to Sound Burst's proprietary dynamic link technology. You can import limitless size, external SoundFont-compatible patches easily and quickly. On top of all that, every sound is fully editable in real time thanks to a wide choice of fully automatable parameters. It just doesn't get any better than this! Sample Farm Pro, along with your VST midi sequencer, is the only Sample Player you need to produce great music. Sample Farm Pro is available for both Mac and PC. The Mac version has been successfully tested with Steinberg Cubase VST, Cubasis VST and Nuendo as well as with Emagic Logic Audio Gold/Silver/Platinum. The PC version has been successfully tested with Steinberg Cubase VST, Cubasis VST, Nuendo, Emagic Logic Audio Gold/Silver/Platinum, Image-Line FruityLoops and FASoft n-Track Studio. Download Sample Farm Free, a streamlined version of Sample Farm Pro. Please note, however, that the sounds included in Sample Farm Free are not included in the commercial version. Sample Farm Free is intended for demonstration purposes only and supports only 4 notes of polyphony (128 notes of polyphony in Sample Farm Pro!) and limits the ability to import external SoundFont compatibile patches to files no bigger than 1 MB (no limit in Sample Farm Pro). Just listen to the MP3 files. They'll give you a taste of what this product can do for you. Don't you think it's time to upgrade from your hardware sampler? Now you can listen to the MP3 demos included o the Sample Farm Lite page All the sounds on Sample Farm Lite are also included in Sample Farm Pro.